The future of our built environment is built today. 70% of the existing building stock will still exist in 2050 (Kiinteistölehti, 2017). We are now defining the opportunities and limitations of how the future homes will allow us to participate actively, decrease emissions and create life-improving services. Keeping this in mind, are we making strategic decisions with long enough perspective or are we too busy with achieving short term objectives? It is about time to discuss how smartness shapes residential buildings – and our cities. Digitalisation of the built environment has been a discussion topic for a few recent years. Still, worldwide productivity growth in the construction business has been among the lowest (The Economist, 2017). Generally, it is not that clear what kind of concrete actions, steps and opportunities there are to create new value through digital solutions in the built environment. Digitalization of homes, buildings, districts and cities will foster innovation and new value creation, as well as allow us to live in a more resource efficient way. However, the dynamics of how and by whom the value is created is not that clear yet. Who benefits from the built environment digitalization? What role does the emergence of smart homes play in the transformation of the built environment? Demos Effect and Fortum SmartLiving unit decided to find out. Through stakeholder interviews and foresight research we investigated what value digitizing the built environment in the context of smart homes can create – and why it is important for the future cities. We found a variety of possibilities to create new value. In our opinion, following four points are the most important ones to remember for all actors in the built environment. 1. A variety of stakeholders and competences are required for developing life-improving smart home solutions in the long run. This creates imperative for open interfaces and standardized data. 2. Smart homes will not be only a nice-to-have solution for ‘tech-geeks’. An increasing level of smartness is expected from the buildings, and sooner or later it will be a standard feature for a wider audience that connects homes to a wider digitalization of the built environment. 3. An increasing proportion of income is spent on living, transportation, energy, food and health. Smart homes enable creating new services in these domains, but also in insurance, maintenance, security and many other fields, therefore extending the value creation possibilities of investors and construction developers. 4. 21st century will mark the end of the fossil based energy system. Smart homes enable optimization of usage and storing of energy during the fluctuations in the production and demand of the renewable energy, like solar and wind. 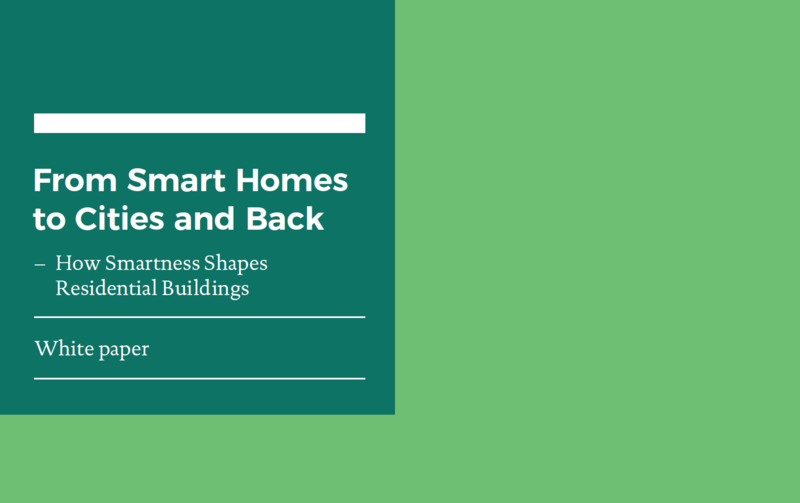 The enclosed white paper discusses these themes more thoroughly and states how smartness shapes residential buildings in the future.